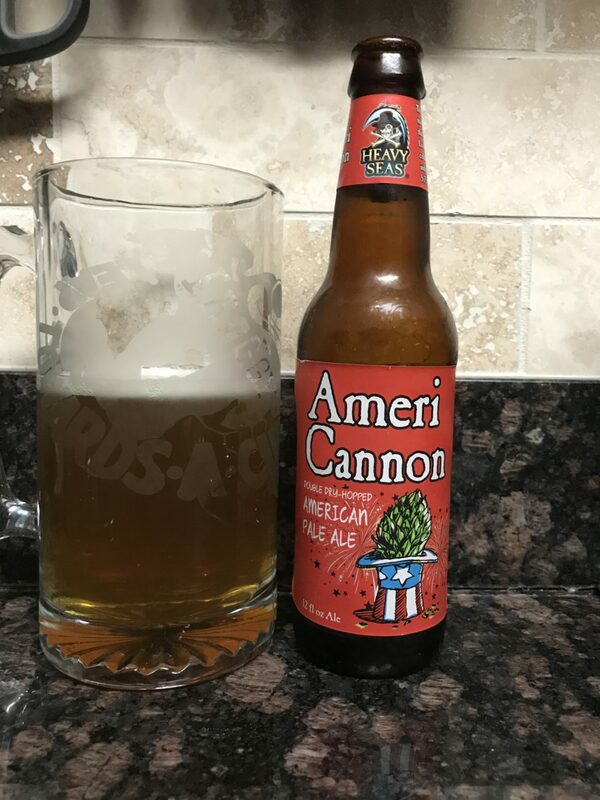 In an effort to review every Heavy Seas beer, I’m now on AmeriCannon, part of the new variety pack of Heavy Seas beers that also includes TropiCannon, Loose Cannon and Double Cannon. Described as “a bold pale ale that’s been double dry-hopped with Centennial hops and Simcoe lupulin hop powder,” AmeriCannon is an ‘American’ IPA – which to me is like saying ‘American’ Oriental rug, but whatever. Unlike TopiCannon, which I surprisingly like, I’m not tasting anything unique or special in this one, though the 5.75% alc is nothing to sneeze at. It’s not gross, like some other American IPAs, just not… you know… distinct… which makes it my least favorite of the Heavy Seas beers. So long as it’s part of the Heavy Seas multipack, it’ll likely wind up in my fridge again, but only for variety, not because I’m drooling for AmeriCannon.